Perfect Uninstaller is a better and easier way for you to completely uninstall any unneeded application that standard Windows Add/Remove Program can't remove. Have you ever been bothered with software applications that can't be uninstalled by the standard Windows Add/Remove Programs? 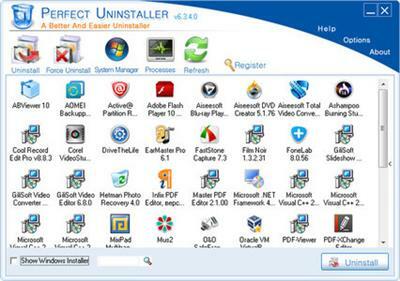 You are the right place!What Perfect Uninstaller can do for you ? * Forcibly remove unwanted programs that cannot be uninstalled completely from "Windows Add or Remove Programs" control panel applet. * Completely remove Adobe Reader, McAfee, Aol Toolbar, AVG Anti-Virus, Norton 2006/2007 and much more difficult to completely uninstall applications! Start your free trial now! * Faster than the standard removal applet that comes with Windows. * Provide different ways of application view to accord with your use habit: by Icons, by List, by Details. * Forcibly remove hidden application installed in your system. * Fast point to the folder where application installed..
* Check details of a certain program installed in your computer to decide whether to uninstall it or not. * Show details about currently installed applications.